Shop Online? Like Helping Charities? Download this app! 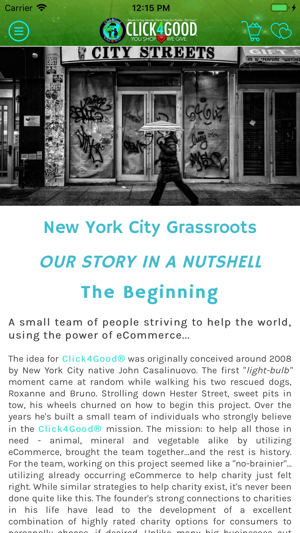 This web and app portal is designed to utilize eCommerce for good causes while also uniting humanity. Our startup company is dedicated to showing that business and social awareness can and should coexist for a more caring, aware world. Help charities using the power of online shopping. 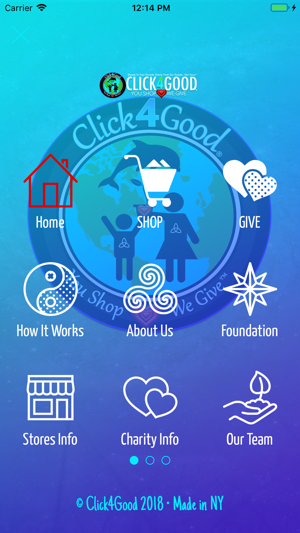 No signup, no hidden fees or fuss...just you and us, united to #DoGood by using #Click4Good whenever you shop online. How It Works: Download our app, then shop/checkout using the links provided. 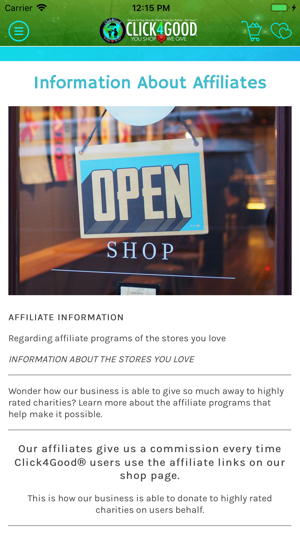 Next our company donates to all charities at no additional cost…or the shopper can even choose a specific one if so desired! Let's work together, business and consumers - to help the world using the action of eCommerce. Shopping happens everyday, why shouldn't it be used for good? Start utilizing your online purchases for highly rated charities today & don't forget to tell your friends! 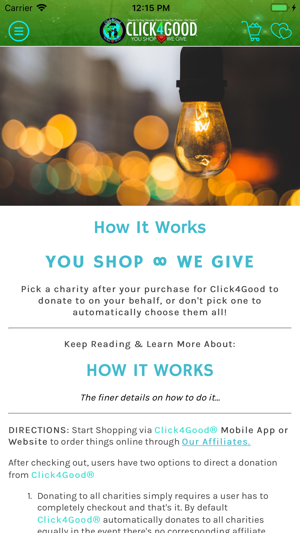 REMEMBER, HERE'S HOW IT WORKS: JUST USE CLICK4GOOD.ORG OR CLICK4GOOD APP BEFORE YOU BEGIN SHOPPING TO HELP GREAT CAUSES DEAR TO YOU. 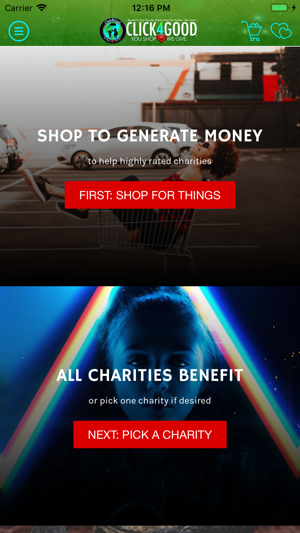 This app is so easy to use… No glitches whatsoever… Shop via the app, go back and enter your charity… If you don’t want to enter your charity, you don’t have to. A portion of your purchase will still get donated… So easy and seamless – highly recommended! I absolutely love this app! There’s no business out there who does what click4good does. I love that I can shop for stuff I need AND help good causes at the SAME time AND there’s no extra fees or catch. Rock on #click4good! !